Luxurious bathrooms need not be the reserve of the rich and famous. With the scope of modern functionality, a few simple steps can go a long way in creating a stand-out bathroom. Read on for a selection of tips and tricks that will make the smallest space sing. Intelligent storage solutions eliminate the need for traditional storage space. If you have a cupboard under the sink, this one’s for you. A mirrored, wall-mounted cabinet is a great start in saving space. Cluttered bathrooms always look smaller and the cabinet can help get all of that clutter out of view. It also means that you can opt for a wall mounted sink. Wide, bold models are all the rage at the moment. You can ditch the cupboard underneath the sink so the basin itself can be as wide as the space allows. The bigger the sink, the more luxurious your bathroom will feel. Bright clean tiles are often a mainstay of chic bathrooms, but they can cost the earth. If you plan accordingly, you can get the desired effect by using pre-cut panels. Mira Showers wall panels come in several different sizes to fit a sleek shower enclosure, the side of a bath or behind a sink. They can create the bespoke tiled look for a fraction of the price. More and more people are cottoning on to the power of the bathroom niche. You can create them in all shapes and sizes but they all achieve the same thing: saving space while looking great. The gist is using the depth of the walls to reduce the footprint of key fixtures and fittings, or just to take the clutter out of the main bathroom space. 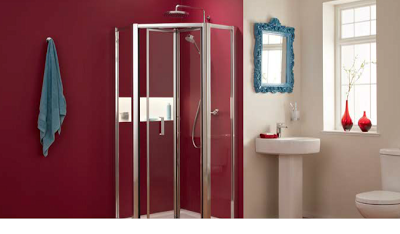 For example, building a niche into a wall by the shower to replace a bulky towel rail could save up to 4” of space. Or you could build a niche into the wall around your bath so that your shampoo, shower gel and bathroom accessories have a neat place to live. Less clutter means more space.